Home > Second report of the Ministerial Task Force for Measures to Reduce the Demand for Drugs. Ireland. Ministerial Task Force on Measures to Reduce the Demand for Drugs. 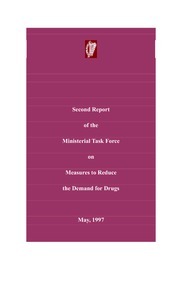 (1997) Second report of the Ministerial Task Force for Measures to Reduce the Demand for Drugs. Dublin: Stationery Office. This document is the second of two policy documents produced by the Ministerial Task Force. The report reviewed progress on the implementation of the recommendations made in the first report relating to the establishment of a Cabinet drugs committee, a national drugs strategy team, and local drugs task forces, and concerning issues of information and research, treatment, rehabilitation, education and prevention, community policing and the allocation of funding and resources. The report then goes on to explore additional areas of concern. These include the misuse of non-opiate drugs, drug misuse in prisons and the treatment of prisoners who misuse drugs, and the role of therapeutic communities in the treatment or rehabilitation of drug misusers. The key recommendations made by the authors of the report deal with young people living in disadvantaged areas in particular, and includes the establishment of a youth services development fund, training and employment of youth leaders from disadvantaged communities, the development and implementation of a substance abuse prevention programme specifically for the non-formal education sector, and the development of specialised outreach programmes. Introduction by Task Force Chairman Pat Rabbitte, T.D.